Nihonium was first reported to have been created in 2003 by a Russian–American collaboration at the Joint Institute for Nuclear Research (JINR) in Dubna, Russia, and in 2004 by a team of Japanese scientists at Riken in Wakō, Japan. The confirmation of their claims in the ensuing years involved independent teams of scientists working in the United States, Germany, Sweden, and China, as well as the original claimants in Russia and Japan. In 2015, the IUPAC/IUPAP Joint Working Party recognised the element and assigned the priority of the discovery and naming rights for the element to Riken, as it judged that they had demonstrated that they had observed element 113 before the JINR team did so. The Riken team suggested the name nihonium in 2016, which was approved in the same year. The name comes from the common Japanese name for Japan (日本, nihon). ^ a b c d e f g h i j k l m n o p q r s t u Hoffman, Darleane C.; Lee, Diana M.; Pershina, Valeria (2006). "Transactinides and the future elements". In Morss; Edelstein, Norman M.; Fuger, Jean. The Chemistry of the Actinide and Transactinide Elements (3rd ed.). Dordrecht, The Netherlands: Springer Science+Business Media. ISBN 1-4020-3555-1. ^ a b c Seaborg, Glenn T. (c. 2006). "transuranium element (chemical element)". Encyclopædia Britannica. Retrieved 2010-03-16. ^ a b c d Thayer, John S. (2010). "Relativistic Effects and the Chemistry of the Heavier Main Group Elements". In Barysz, Maria; Ishikawa, Yasuyuki. Relativistic Methods for Chemists. Springer. pp. 63–67. doi:10.1007/978-1-4020-9975-5_2. ISBN 978-1-4020-9974-8. ^ a b c Hofmann, S.; Heinz, S.; Mann, R.; Maurer, J.; Münzenberg, G.; Antalic, S.; Barth, W.; Burkhard, H. G.; Dahl, L.; Eberhardt, K.; Grzywacz, R.; Hamilton, J. H.; Henderson, R. A.; Kenneally, J. M.; Kindler, B.; Kojouharov, I.; Lang, R.; Lommel, B.; Miernik, K.; Miller, D.; Moody, K. J.; Morita, K.; Nishio, K.; Popeko, A. G.; Roberto, J. B.; Runke, J.; Rykaczewski, K. P.; Saro, S.; Schneidenberger, C.; Schött, H. J.; Shaughnessy, D. A.; Stoyer, M. A.; Thörle-Pospiech, P.; Tinschert, K.; Trautmann, N.; Uusitalo, J.; Yeremin, A. V. (2016). "Remarks on the Fission Barriers of SHN and Search for Element 120". In Peninozhkevich, Yu. E.; Sobolev, Yu. G. Exotic Nuclei: EXON-2016 Proceedings of the International Symposium on Exotic Nuclei. Exotic Nuclei. pp. 155–164. ISBN 9789813226555. ^ Moody, Ken (2013-11-30). "Synthesis of Superheavy Elements". In Schädel, Matthias; Shaughnessy, Dawn. 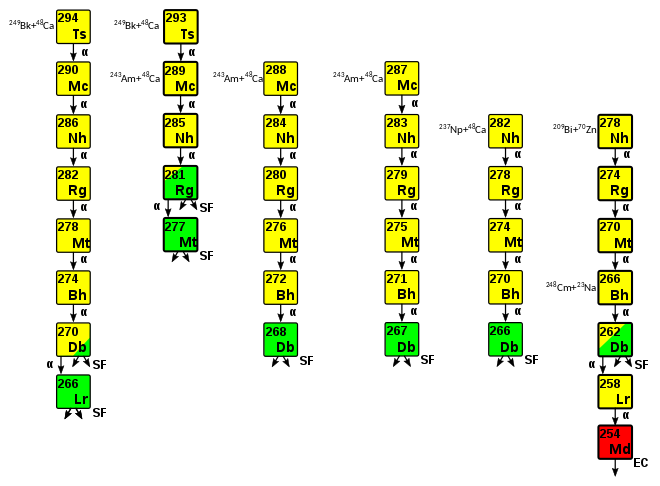 The Chemistry of Superheavy Elements (2nd ed.). Springer Science & Business Media. pp. 24–28. ISBN 978-3-642-37466-1.